Figure 1. 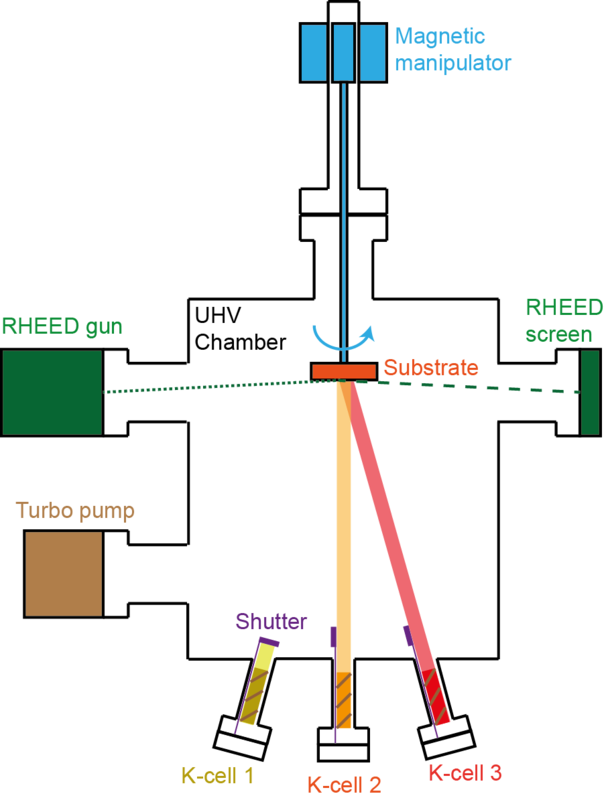 Schematic of an MBE chamber. The growth process is performed in an ultra-high-vacuum (UHV) environment created by continuous pumping by a turbo pump. Sample holder with a substrate is attached to a magnetic manipulator which can be rotated during growth. K-cells are attached to the bottom of the chamber, pointing towards the substrate. Selective opening of shutters on each K-cell ensures the growth using only specific elements. Characterization of substrate and the thin-film is continuously monitored during growth, and is performed by RHEED. Molecular beam epitaxy (MBE) is an experimental technique utilized for layer-by-layer growth of thin films of various quantum materials. Out of the variety of thin film growth techniques available, MBE is considered to be one of the cleanest, but also one of the most technically challenging and demanding, as MBE growth takes place in ultra-high vacuum (UHV) environment. Typical MBE experimental setup consists of two or more Knudsen effusion cells (K-cells), located at the bottom of a UHV chamber and aligned towards the center of the chamber where a sample holder with a substrate is located (Figure 1). Each individual K-cell contains a different element in ultra pure solid form (i.e. elemental 99.999% Selinum, Bismuth, etc.) which can be used in the thin film synthesis. The process of MBE growth starts by heating the K-cells to appropriate temperatures until the elements in each cell reach a sublimation point. Then, the shutters are opened and physical vapor from each K-cell diffuses though the chamber until it reaches the substrate where it gets deposited, and the thin film gets formed. The final composition and stoichiometry of the film will depend on the temperature and surface atomic structure of the substrate, as well as the flux ratios of individual components reaching the substrate. For more uniform growth, substrate can be continuously rotated at low rotation speeds (~1-2 rotations per minute) by utilizing a stepper motor attached to the magnetic manipulator. To characterize the samples in-situ during growth, we use reflection high-energy electron diffraction (RHEED). Electrons emitted from the RHEED gun (Figure 1) incident at a very low angle with respect to the sample surface are diffracted, and the resulting diffraction pattern is observed on the screen. This pattern can reveal: (1) quality of the film surface, and (2) film thickness down to a single monolayer.